Thanks to the generosity of Hingham resident Gerry Bennett, the Historical Society has recently been loaned the diaries of Carl Burr (1884-1961), a seventh generation Hingham resident who lived his entire life at the family homestead at 61 Leavitt Street, across from today’s Hingham Public Library. I have just completed cataloging these diaries to make them accessible to researchers and others interested in this local history resource. Click on the link to read the full Carl Burr Diaries Finding Aid. Carl Burr was the eleventh child of Elisha Burr (1839-1909) and Mary Pratt Burr (1842-1940). He married Esther (Essie) M. Snyder (1889-1975) of Cohasset on June 15, 1910 and they raised two children, Alston P. Burr (1910-1979), who after 1940 lived next door at 67 Leavitt Street, and Constance (Connie) Burr Talbot (1915-1989) who spent her married life in Darien, Connecticut. He kept a daily diary for most of his adult life. 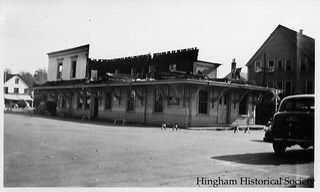 The entries provide a window on a Hingham that was changing rapidly from a rural farm town in the early 1900s to the suburban community it is today. Changes that are evident through his diary’s descriptions of modes of transportation and use of open space. Carl Burr never owned a car. He didn’t have to travel far to visit family. 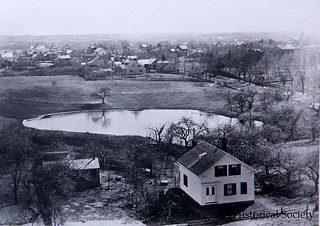 Carl’s younger brother, noted decoy maker Russ Burr (1887-1955), lived next door at 55 Leavitt Street until his death in 1955, older sister Mary (May) Burr Ripley (b. 1878) and her husband William (Bill) Ripley (b. 1876) lived two doors up at the corner of Leavitt and Spring Streets. Burr Homestead houses along 57, 61 and 67 Leavitt Street. Photo taken May 2, 2015 by Robert H. Malme. He was within walking distance of stores in both Hingham Center and Hingham Square. In his early years he was a plumbing and heating contractor and his entries list his extensive use of the local street railway system to visit clients throughout Hingham and neighboring communities. He used the Nantasket and Old Colony railroad lines to take off-hour excursions to Nantasket Beach and Paragon Park or to travel to Cohasset to visit his future wife. 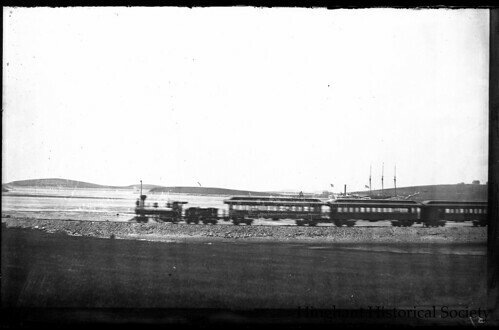 Nantasket Railway train heading towards Hingham near the Weir River around 1900, courtesy of the Hingham Historical Society. Through connecting rail lines in other towns, he could travel far from home. He writes on August 15, 1909 traveling to Providence, RI via ‘the electrics’ for a dinner. In the 1920’s he became maintenance supervisor to buildings in Boston and started daily commutes via the Old Colony Railroad into South Station often returning home in the early afternoon. And like this past winter season, he noted several times when severe snowstorms prevented the trains from running. As the years went on, particularly after World War II, however, the railroad started to give way to the popularity of the automobile. His entries refer to rail service starting to get cut back. 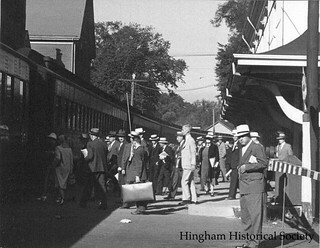 On April 3, 1948 he notes he can no longer take a 12:30PM trip back to Hingham from Boston, but must now take a train to Quincy and then a bus. By the late 1940s, any late evening work would require his son Allston picking him up in his car from Quincy or the ‘rapid transit’ station at Columbia, today’s JFK-UMass station. After he stopped working in Boston in 1951, he started to rely totally on family, or friends, to transport him around town or elsewhere. Toward the end of his life, on September 8, 1959 he noted traveling on the new Southeast Expressway, its opening causing the end of railroad service in Hingham for nearly 50 years. 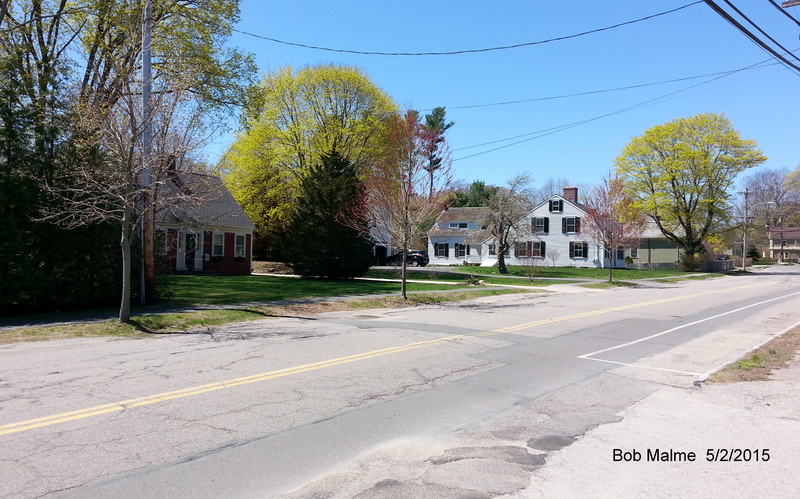 Part two will discuss the changes the diaries chronicle in Hingham’s open spaces. This entry was posted in Uncategorized and tagged Archives, automobiles, Burr family, Carl Burr, railroad, streetcars, transportation.